Personally, I blame the toddlers in the house-share I stayed at. Nobody vectors a disease like a toddler. Imagine the Dutch, with their amazing skills at canal building, dredging and drainage, cut a channel directly into my brain, and siphoned it into the following. Read more "My Drupalcon Amsterdam notes"
I'm (still) at Drupalcon Amsterdam! Read more "I'm (still) at Drupalcon Amsterdam!" Read more "Custom in-browser field state changing on Drupal API-built forms"
My cup runneth over, which is just as well as I'm going to be starving by the time I get there. Read more "Drupalcon Amsterdam, Tour de Drupal and some great informal BoF sessions"
If there are only two or three worksheets in the file, my advice is: do it by hand! Read more "Exporting all Libreoffice worksheets as CSV"
It's a slow process. A bit like building a site with all your downloads coming via Composer or Drush Make. 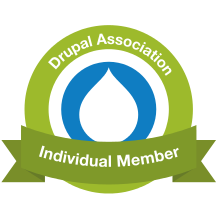 Read more "Drupal gradually adopts Composer; and so does Drush Instance"
Everything useful in Drupal seems to be in alpha, beta or dev these days. Read more "Upgrading media and CKEditor to get WYSIWYG plugin to work"
So beta you wouldn't believe. So beta it blows your wig off. Read more "Automatically convert Drush make to Composer"
Despite the expected August gardening slump, it's been quite the weekend down the farm and at home. Read more "Planting, pelargoniums and pruning"